I love these as a nice alternative to regular grilled pork chops and the quinoa gives them a great crunch. 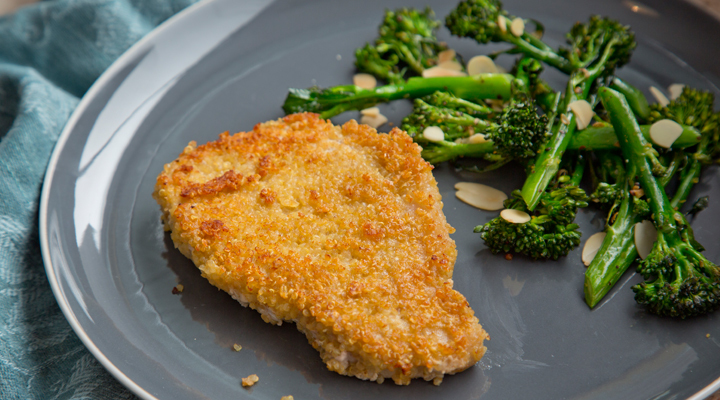 The chops are so tasty with the Parmesan, but you could use another cheese if you prefer. This is a lovely light dinner that could also be served with sweet potato mash or a salad. Put the roasted buckwheat in a blender or food processor and blitz until it forms a flour. Pat the pork chops dry with kitchen paper and season with salt and pepper. Combine the cooked quinoa and Parmesan in a wide shallow bowl. Place the egg and milled buckwheat in two separate wide shallow bowls. First dip the pork chops into the buckwheat, patting off any excess, followed by the egg and lastly the quinoa and Parmesan. Set aside on the lined tray. Bash the coriander and mustard seeds in a pestle and mortar until lightly crushed. Place the broccoli on a large baking tray and toss with 2 tablespoons of the oil, the crushed seeds and the garlic. Roast in the oven for 15 minutes, until slightly charred and crispy. While the broccoli is cooking, heat the remaining 2 tablespoons of oil in a large pan set over a medium heat. Add the coated pork chops and fry for 6 minutes on each side, until golden brown and cooked through. Serve the roast broccoli alongside the pork. Sprinkle with the flaked almonds and dig in. Tip - You could serve this with some sweet potato chips instead of or as well as the broccoli, but the pork and broccoli are great when made the day before and packed for lunch the next day. Or you can prep the pork in advance and keep it in the fridge until you’re ready to cook.